Leicester boss Craig Shakespeare praised recalled midfielder Riyad Mahrez after his goal earned the Foxes a point against West Brom. Mahrez has struggled for form this season, having failed to secure a move away during the transfer window after putting in a transfer request, and he was dropped at Bournemouth prior to the international break. 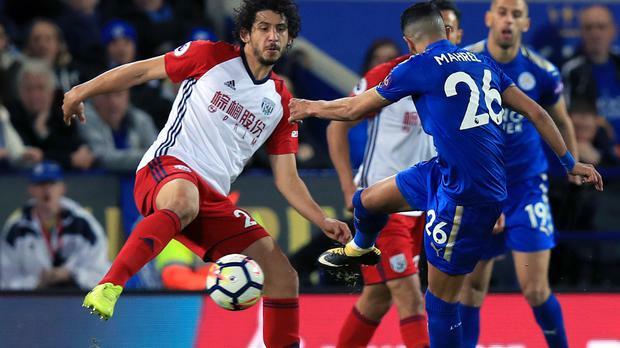 The Algeria international scored his first goal of the season to cancel out Nacer Chadli's 30-yard free-kick as it finished 1-1 at the King Power Stadium on Monday night. Shakespeare, a former player, coach and caretaker manager for West Brom, was pleased to see Mahrez respond with a positive performance. "He didn't go away with Algeria and stayed at the training ground and worked really hard and gave me an issue in terms of starting him tonight," said Shakespeare. "He had an opportunity before that, which with his quality he'd expect to score and he'll probably be disappointed about that. "But he showed again that he's got that character to keep going and he got his reward with the goal. It was a great first touch by Riyad and a really good finish. "You want the response and the right response and we have had that from him." Leicester were unable to end their home hoodoo against West Brom, who are now unbeaten in eight visits to the King Power Stadium, formerly the Walkers Stadium, winning five, and it always looked like a record they would extend after Chadli gave them the lead with a lovely curling strike just after the hour mark. Mahrez equalised with 10 minutes remaining, but Leicester were unable to go on and get that elusive victory, meaning the last time they won at home against Albion was January 1994, Iwan Roberts scoring twice in a 4-2 success at Filbert Street. West Brom head coach Tony Pulis revealed a knee injury kept Ben Foster out of the match. Albion have yet to determine the extent of the injury, which the 34-year-old goalkeeper sustained during the international break while playing in the garden with his children. However, Pulis admitted he is worried about the problem given Foster missed 10 months between 2015 and 2016 with anterior cruciate ligament damage. To compound his goalkeeping problems, stand-in Boaz Myhill, making his first Premier League start since April 2016 in Foster's absence, also finished the game with an injury. "I don't know what happened with Bo as he was taken straight to the drug testers, so I don't know if it was his hamstring, his back or his groin," said Pulis. "I sent Gouldy (Jonathan Gould, goalkeeping coach) round to ask him if he wanted to come off and he said he was fine. "Bo was in because Ben has hurt his knee, which is an enormous worry for us because I think he is one of the best goalkeepers in the Premier League. We'll have to check as it might be minor, so it will be scanned. "We need to find out exactly what it is before we move on and at the moment we don't know exactly what it is. "He was playing with his son in the back garden and he's just tweaked his knee and because he's had the cruciate we are a little bit concerned. There was no way in a million years we were going to take the risk with him tonight."